Check Lily out on her website. On any given day a 911 operator will speak to someone in their darkest hour, many times bottling the stress from calls that range from births to deaths. A new program at the Nash County 911 center helps to ease that stress, through the use of dogs.Nash County Communications Training Director Mark Reavis is spearheading the new program known as “Therapy Dogs in 911, Making a Positive Difference.” The program allows trained and registered therapy dogs to be used in the center to ease some of the stress load that comes with working in emergency communications. “People don’t realize what a 911 operator goes through when they receive the types of calls they get in the center,” Reavis said. “It is not uncommon to hear someone take their last breath while you are doing everything you can to get help to them, and that takes a toll on people. 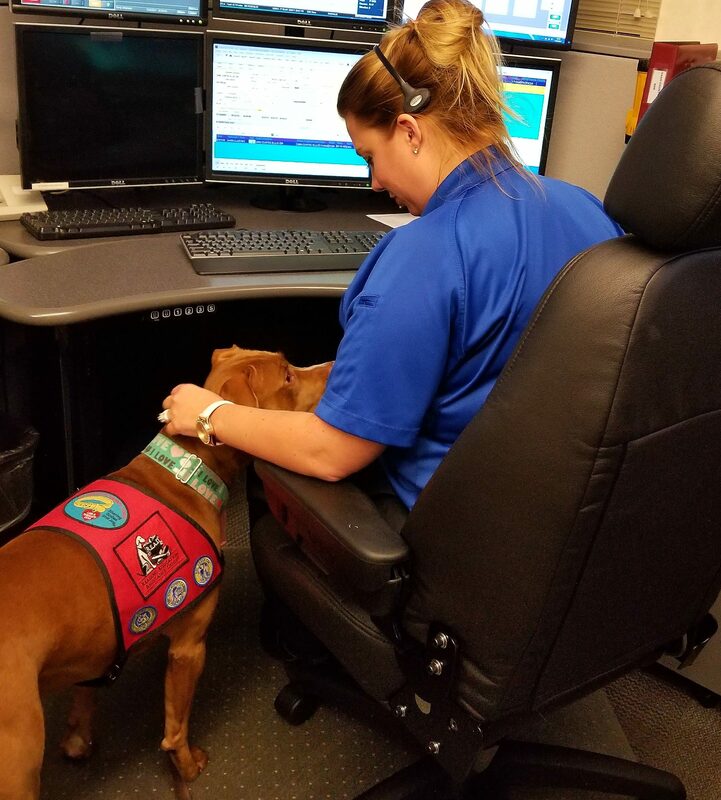 On any given day Reavis’ Sheepadoodle “Hero” can be requested by those working in the 911 center, but there are certain occasions where Hero is brought in without being requested. “Any time there is a major incident that the staff has handled, especially if there is a critical incident debriefing, the dogs are part of that,” Reavis said. The other dog currently utilized by the county is a pit bull named “Lily.” While Hero is still considered in training to become certified, Lily has already passed all of the requirements. The Alliance of Therapy Dogs, or ATD, requires that a dog be one year of age to be fully certified. Hero is currently a couple of months shy of that.